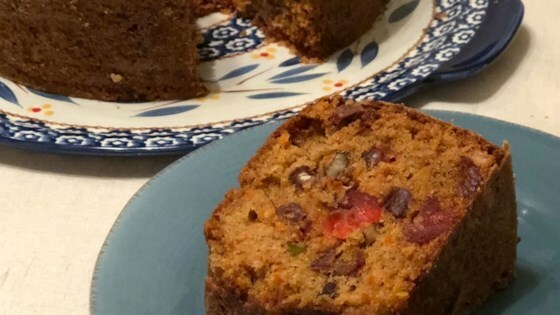 "This is similar to fruitcake, and is excellent to serve." Beat the vegetable oil with the white and brown sugars. Beat in the eggs one at a time. Stir in the grated carrots. Add the 2/12 cups flour, baking soda, baking powder, ground cinnamon, and salt. Stir until just moistened. Toss the raisins, candied cherries, candied mixed fruit, chopped dates, and the chopped walnuts with the remaining 1/2 cup flour. Stir to coat. Add fruit and nut mixture to the batter and stir until combined. Pour batter into the prepared pan. Bake at 325 degrees F (165 degrees C) for 1 1/2 hours. Everyone at work who did not like fruit cake loved this cake. They all wanted the recipe. I soaked the fruit mixture in bourbon overnight for a little extra kick. Yummy. Has a lighter texture than traditional fruitcake but still dense enough to satisfy my husband's fruitcake craving.